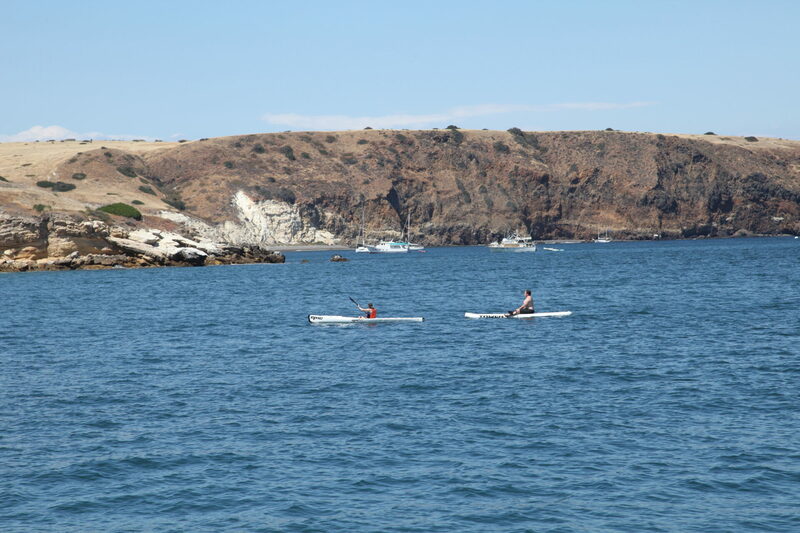 Some high school friends and I embarked on a Memorial Day Channel Islands Boating Adventure for 4 days, sailing from the Channel Islands Harbor to the Channel Islands, about 20 miles off the coast of Los Angeles/Ventura County. Chief Morale Officer: CJ (me) (this title basically means I have no idea what I’m doing and I’m around chiefly for everyone else’s entertainment). Arguably, the dog contributed more than I did. Chief of Getting in Everyone’s Way: Seamus the dog, Jay’s pit-bull. Jay and Tyler had spent the night on the boat, whereas I was dropped off around 9AM by dad – allowing me to get some family time in with my parents the night before. The boys and Seamus the dog were already prepping the boat for pushing out on our Channel Islands boating adventure, while Chan introduced himself and gave my dad a mini-tour (I had already spent some time on the boat over New Year’s Eve). 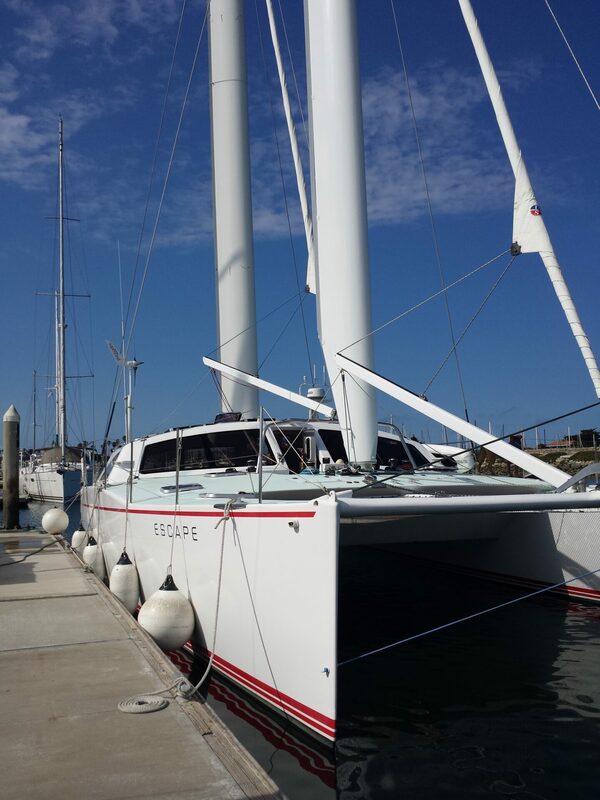 I waved goodbye to my dad, and we pulled out of the Channel Islands Harbor, where our Catamaran, Escape, was docked, around 10AM Friday morning. I literally had no idea what to expect – wasn’t sure what the itinerary was, or what would be involved in getting 4 people in a rather comfy Schooner across the ocean. 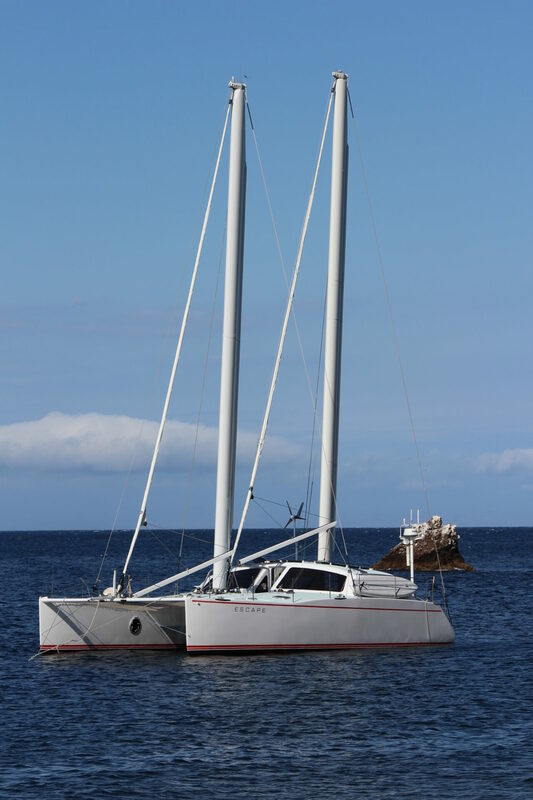 Jay later explained that his Catamaran was technically a Schooner because it had two masts of roughly equal size (or the main mast taller than the foremast. The other 2-mast configurations in the running would be a Yawl, with a shorter mizzen mast astern the rudderpost; or a Ketch, which has a second shorter mast astern of the mainmast and forward of the rudder. 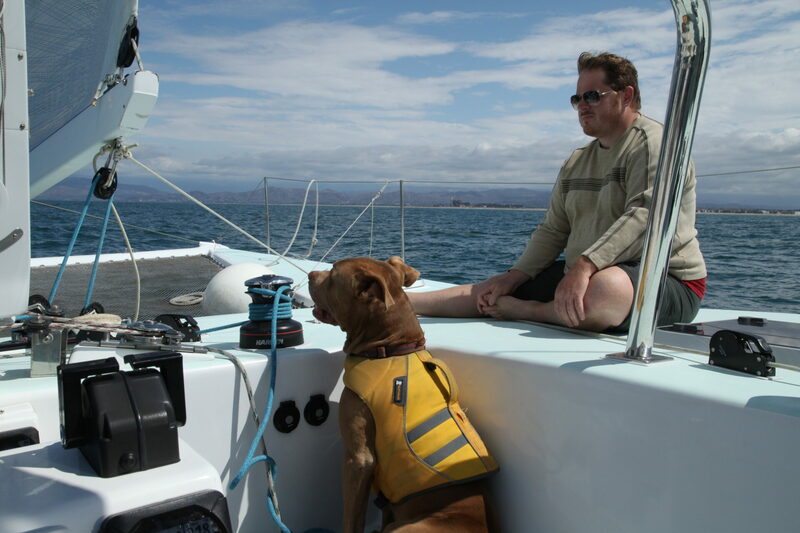 Jay explained that the Catamaran designer, Chris White, would not admit that the boat was actually a Schooner. It turned out, quite a lot was required to get this boat across the water, especially in unseasonably rough and windy waters, with a nasty head-wind (up to 30 knots). 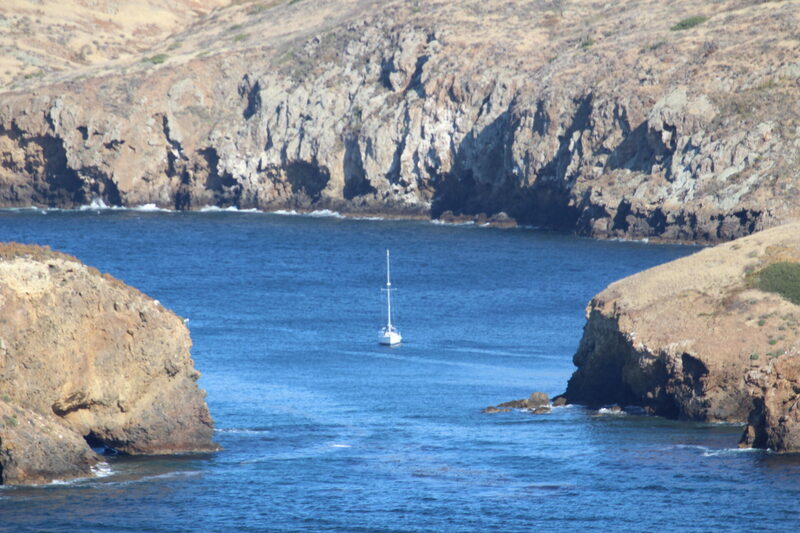 It took us about 6 hours in total to cross the short 20 miles to Santa Cruz Island, with both sails unfurled. The boat was plenty rocky, and there wasn’t much to do but sit on the cold and windy deck to try to get some sun and try not to get seasick. It was touch and go but some Dramamine and excellent breakfast burritos a la Chef Jay helped me get through it. This was definitely the most arduous and taxing day. Coming back we would have a much easier (and warmer) time. 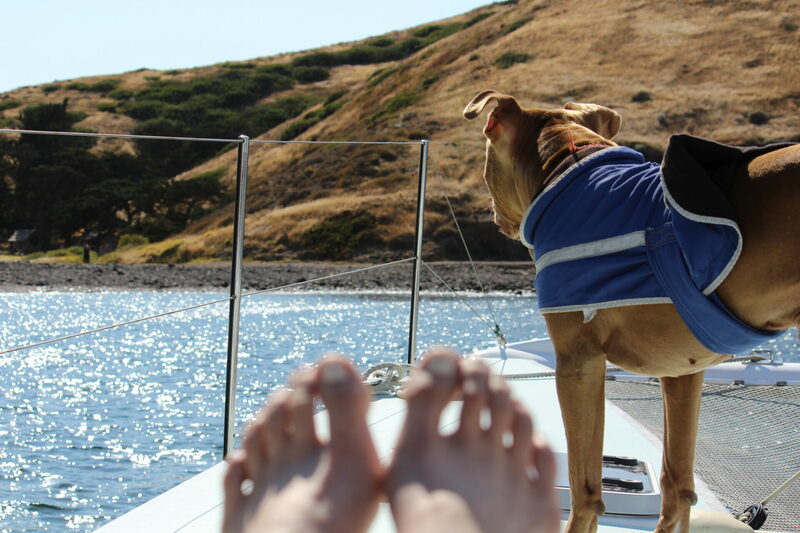 After anchoring, Chan, Tyler and I took the dinghy ashore to explore the island and hike, while Jay stayed on the boat to watch Seamus. Seamus was not a happy camper that day, the rough and windy water making it hard of him to find his balance, poise, and calm. We had a relatively easy time bringing the motorized dinghy ashore and anchored it on the beachhead and we went exploring. 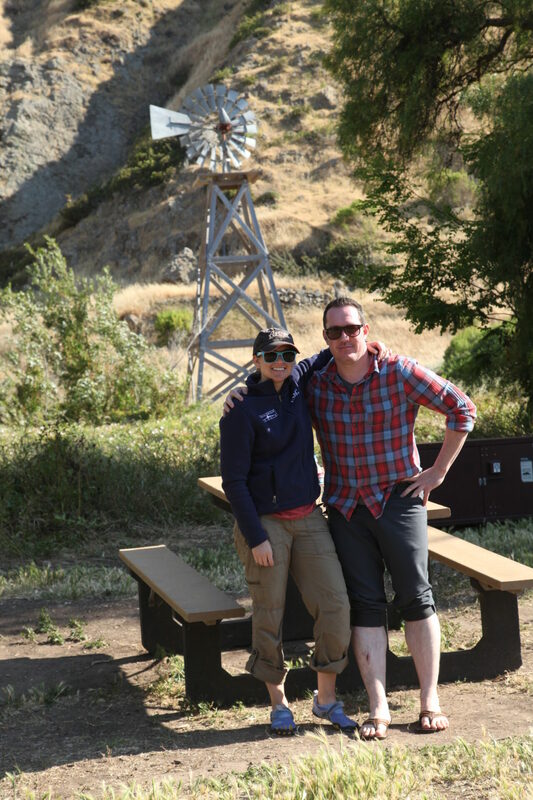 We decided to make for the ranch house area, and then climb the hill overlooking the bay. 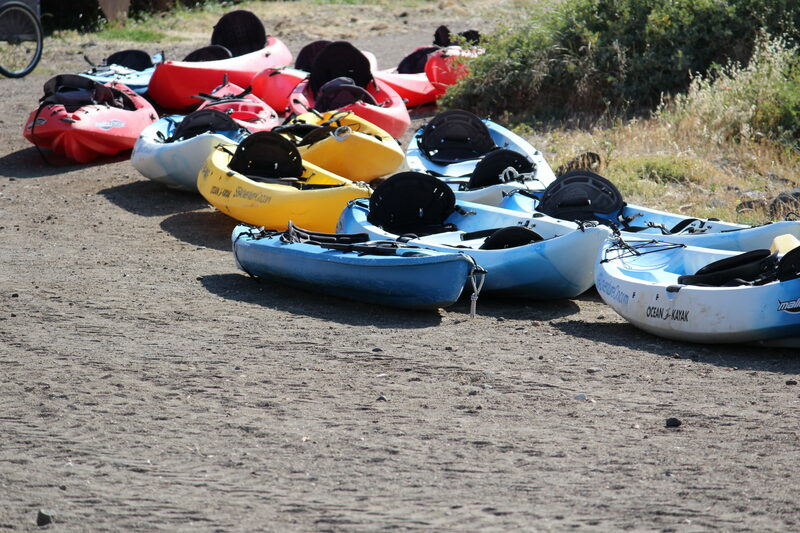 First, we encountered some of the local kayak guides, and chatted with them about the island. They said they got a good laugh as we were pulling in to the bay – apparently our dinghy trailed behind the boat in a way that made it look like our boat had a baby, bobbing along behind. We asked them about their living and working arrangement, and they explained that they stayed on the island for 3 days shifts, and made a little camp when they weren’t working. They showed us the hiking route we should take through the island, and we set out on our way. 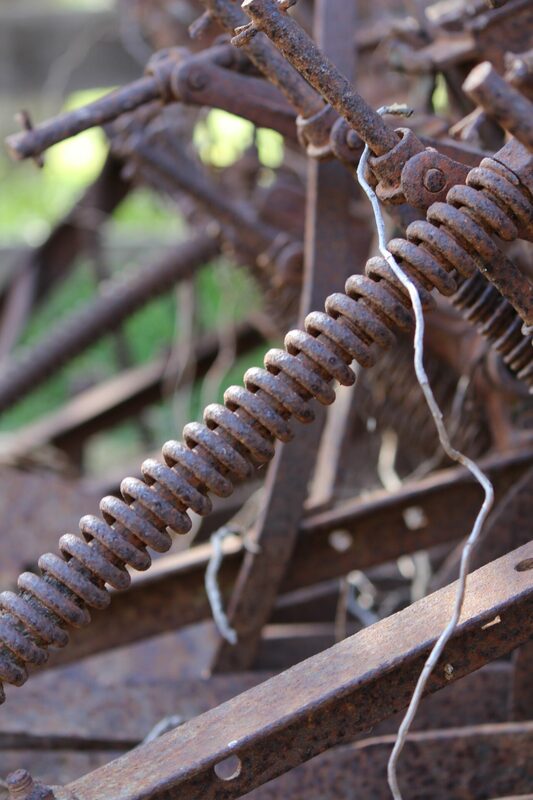 The first thing we came upon was some rusted our farm equipment that originally was used to ranch and work the island. 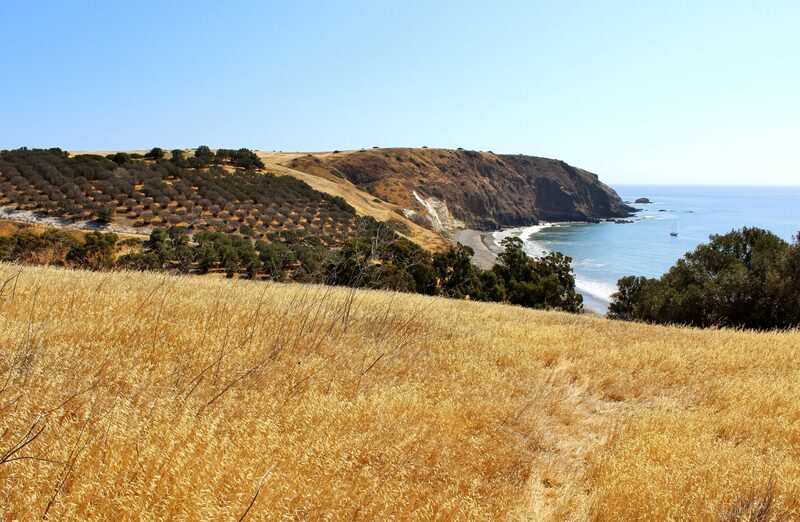 Santa Cruz Island’s original history consisted of ranching – sheep herding and farming – and many immigrant workers were brought in to work the land. 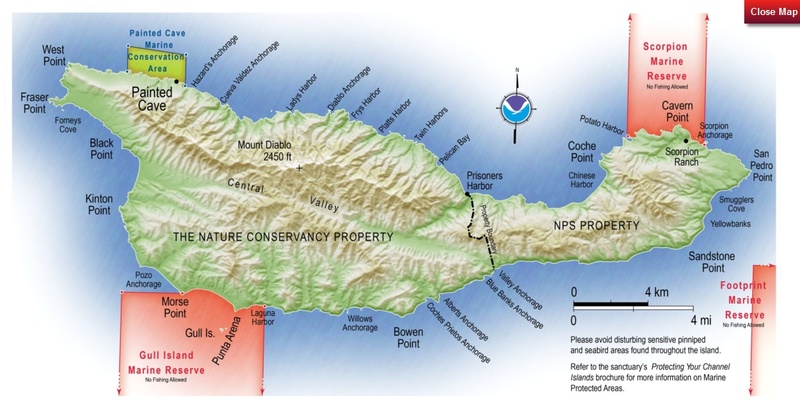 Since The Nature Conservancy (TNC) (Western side of the island) and the National Park Service (East side of the island) took over, ranching was banned and the island was brought back in to it’s “Native” state. Of course there is some debate around why ranching, a key part of the island’s history, is now banned. 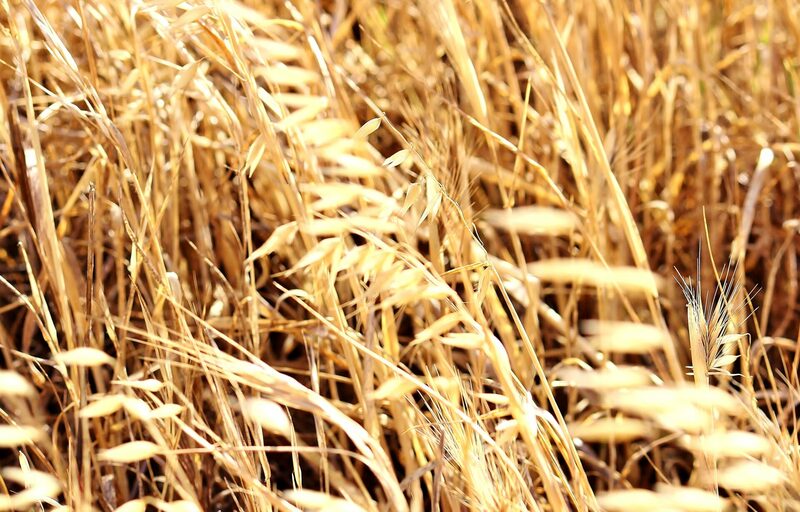 Naysayers would argue that ranching, when done in a sustainable manner, can be preserved as can be the land and the history. 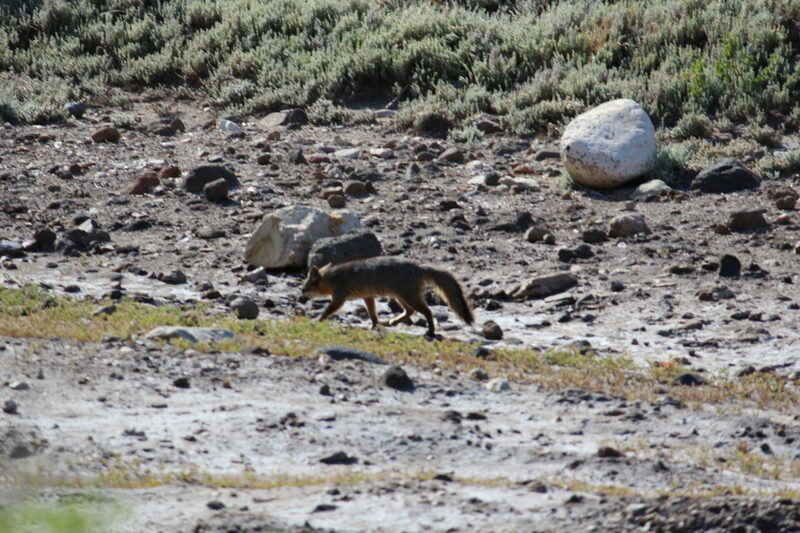 There was no more ranching, but there were plenty of indigenous foxes – the population was nursed back to health after an epidemic of dog-feces born distemper nearly wiped them out year’s ago (incidentally, this led to further Seamus unhappiness, as we weren’t allowed to bring him ashore). 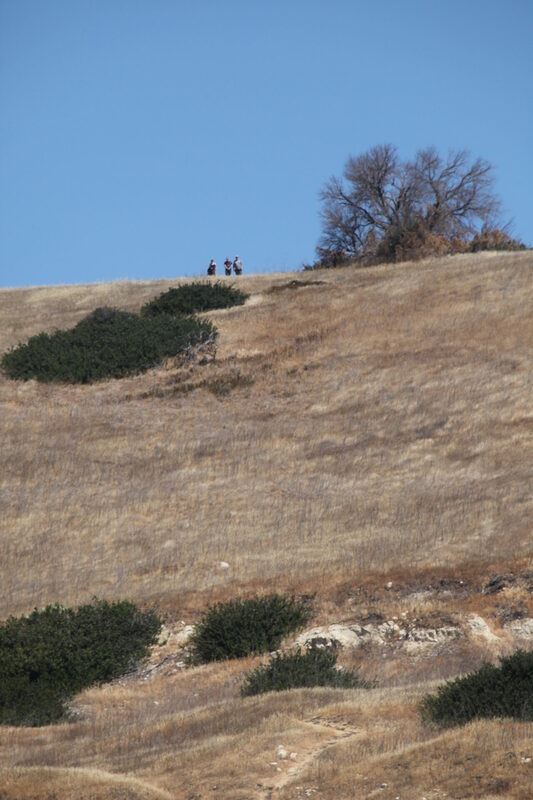 Along our hike, we saw typical Southern California chaparral, low shrubs, and fields of gold. Nearly, at the summit, we decided to head to the loop overlooking Scorpion Bay, rather then head to the North side of the island to visit Potato Harbor (anyways, we would cruise by there the following day). 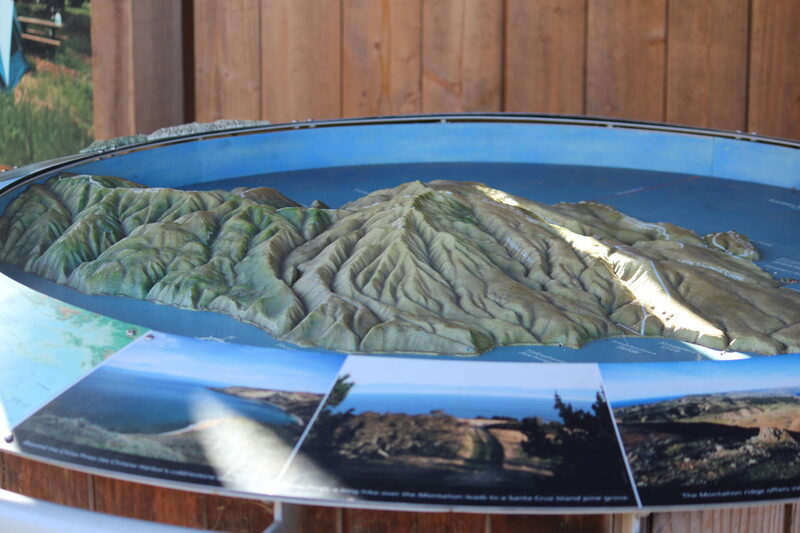 We all remarked that Potato Harbor probably looked like a potato – the topographical map we found later would prove it. 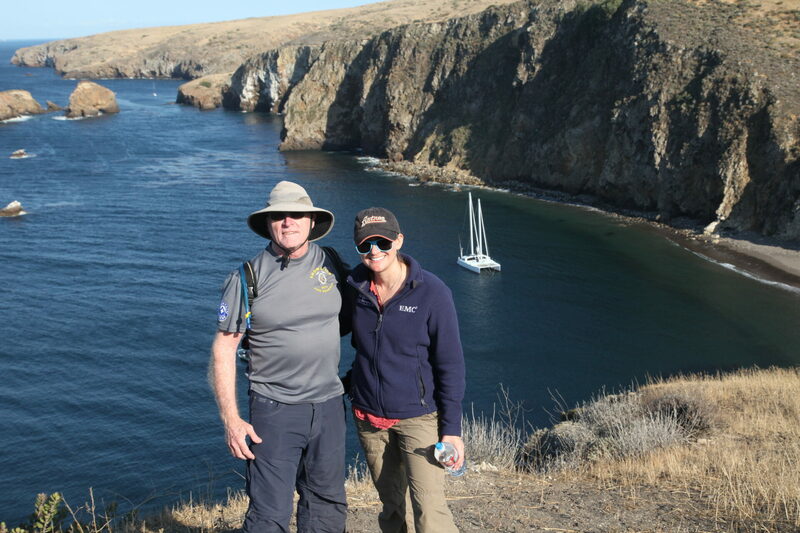 And the apex of our hike, here’s a neat shot overlooking the boat with Chan and me, in the throws of our Channel Islands boating adventure and hike. Back at the boat, Jay was already prepping an awesome dinner of clam chowder (with extra clams and bacon), coupled with grilled French bread with butter and garlic. #Boatlife eating seems to be better than regular life eating! 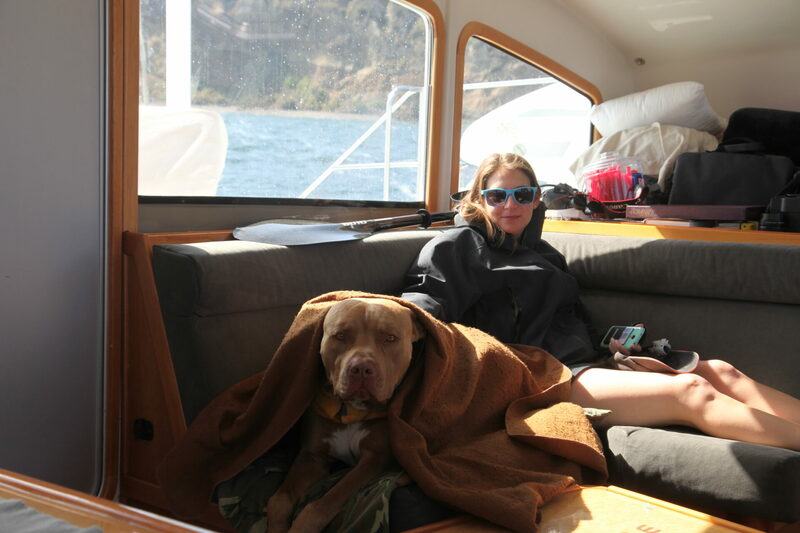 Exhausted, we all turned in pretty early, ready for another day of Memorial Day Channel Islands boating adventures on Saturday. Today is Saturday, 23 May 2015. We departed Scorpion Bay around 0730 this morning heading for Pelican Bay. The winds were high, around 30 knots from the west and the waves were 6-8 feet. It was a rough ride going west. We went into Potato Harbor briefly on the NE tip of Santa Cruz Island, but it was not well protected from the wind or waves. We also dipped in to Chinese Harbor and Prisoner’s Harbor but neither had good protection. We did see a trail/road leading up out of Chinese Harbor that we might check out on a future trip. We sailed in to Pelican but there were half a dozen boats there and several more coming on the horizon so we left Pelican and sailed towards Smuggler’s. With just the mast foils we were going about 6.5 knots in 25 knots of wind from the port stern. We put up the foresail when the wind died to 22 knots and we were sailing at 8.4 knots with just the foresail and the mast foils. Although the waves were still big, we were now going with them and the ride was very pleasant. 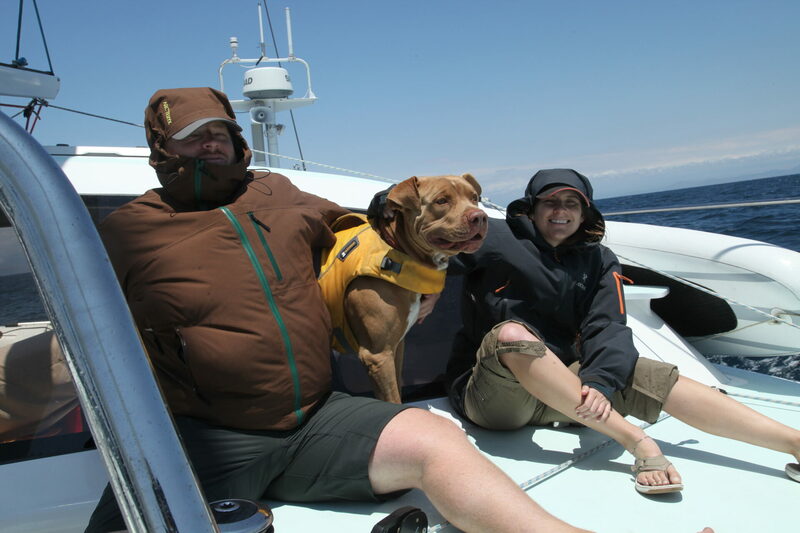 As we rounded the east end of Santa Cruz the winds dropped to 14 knots and curved more Northerly so we put out the mizzen sail and gybed Still going 6 knots. We anchored in Yellowbanks at 1140 in 20 feet of water and the boat was very peaceful and gentle. Jay took Seamus on a paddle board ride and both Tyler and Chandra got to try out my kayak. Chandra spent the rest of the afternoon out on the front deck getting some sun tan. Jay is preparing spare ribs and corn on the cob for dinner so it’s going to be a great meal and a great night’s sleep. I did bust out the book Seabiscuit – Jay and Tyler both commented, “Hey, you know that has nothing to do with the Sea, right?” Sigh. 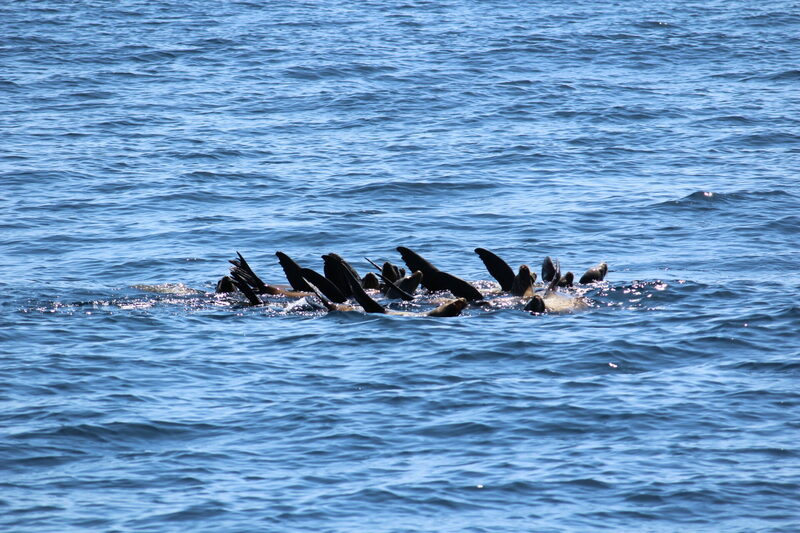 As we sailed towards Potato Harbor, we were greeted by some seals. 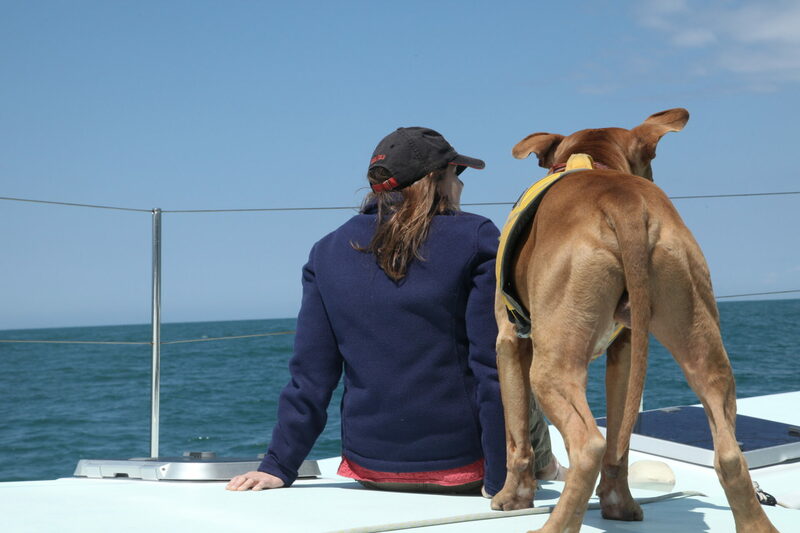 As we spent the day searching for anchor, we did not go ashore. 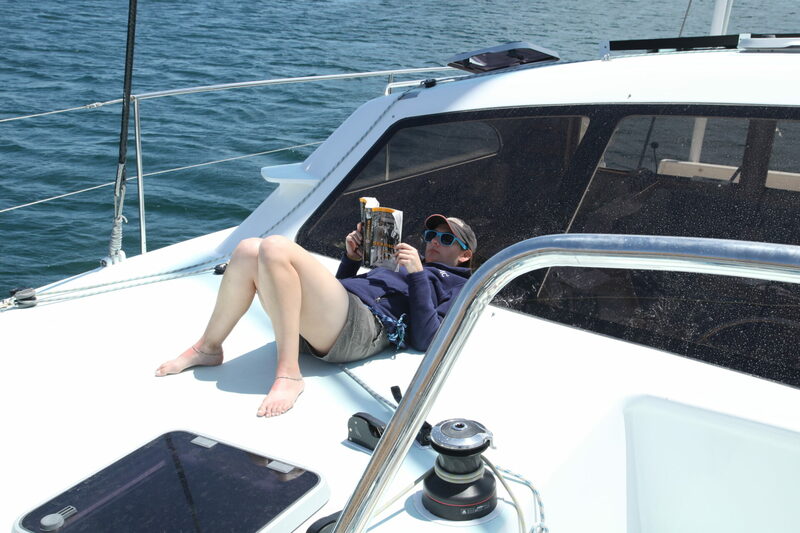 I spent a lot of time reading and attempting to tan, even at one point in a bikini. We even got to try out Chan’s kayak and $400 oar. 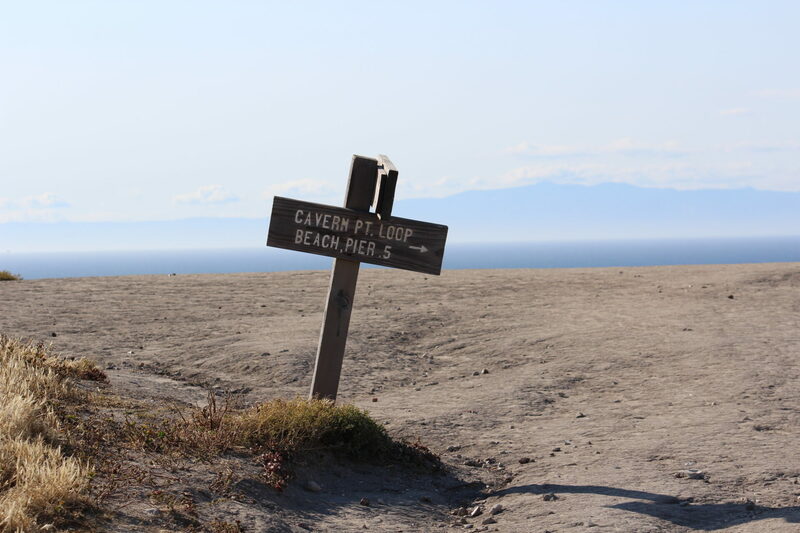 Bizarrely, I was able to get cell phone reception until we turned the corner on the island (huzzah, AT&T!). We anchored at the quite crowded Yellowbanks, and after another awesome dinner we had some post-dinner excitement. We started gyrating to the tune of the 30 knot winds, and had a scary moment where we thought we may hit another boat, judging by the distance we were from the nearby anchor-lights. Luckily, our single anchor held firm and our radius had enough give that we did not run in to any of the nearby double-anchored boats. Again we retired somewhat early after a few beers, conversation, and Scrabble. Today is Sunday, 24 May 2015.I took Jay, Chandra, and Tyler ashore at Yellowbanks to hike the bluffs this morning around 0900. The landing was difficult because of the swells. The dinghy got swamped about 2/3 full of water and all the landing party got wet as did I. I spun the dinghy around after they all hopped out and headed back into the waves almost flipping over backwards, but made it through the breaker and immediately pulled the plug in the dinghy to let it start draining. By the time I got back to Escape the water was all out. I spent the morning wiping out the hulls and wiping them with chlorine. Jay, Chandra, and Tyler hiked around the old ranch houses at Smuggler’s Cove and then up on top of the bluffs above Yellowbanks. They got back to the beach about 1130 but could not find a place where I could land the dinghy because the breakers were so big. So, I towed the paddle board behind the dinghy and rushed in towards shore so they could get it and then darted back out to avoid the next swell. Jay got the paddle board and rowed Chandra and Tyler out to the dinghy and then I towed him back to Escape. Arouind noon we left Yellowbanks and motored towards Coches Prietos. We had to motor the whole way because the wind was right on our nose. Alberts Anchorage had two boats in it and Coches Prietos had half a dozen in it plus there was 20 knots of wind so we turned around and hoisted our sails to sail back to Yellowbanks. We sailed about five minutes before the wind died and then turned to be right on our nose again. We motored for a while and then the wind came up again to about 15 knots on a broad reach so I put up the sails and was sailing at about 8.4 to 9.2 knots back towards Yellowbanks. We anchored at Smuggler’s Cove at about 1600 in 15 feet of water. We had the remainder of the spare ribs Jay made yesterday along with some rice and beans. Jay took Seamus on the paddleboard and I went kayaking. As Chan mentions, Jay, Tyler and I hiked up atop Yellowbanks, which overlooked an olive orchard that was quite picturesque. Chan was able to capture the three of us on the summit with his super-zoom (he and I also exchanged photography tricks throughout the trip, and Tyler, with his digital art background, helped me learn Photoshop 101). Chan very nonchalantly glosses over the fact that we had to swim out to the dinghy in freezing, rocky, swell-y water, in what Tyler would deem as “creepy ocean.” This was after we learned a hard lesson of nearly capsizing the dinghy on the way in. Being the last night on the boat, we tried to eat up the leftovers we had onboard, and bonded over the Banchee bottle of wine I brought along (thanks Dad!). We swapped pictures and Chan taught me how to tie nautical knots – can you name these knots? It was a great trip, and certainly an adventure. 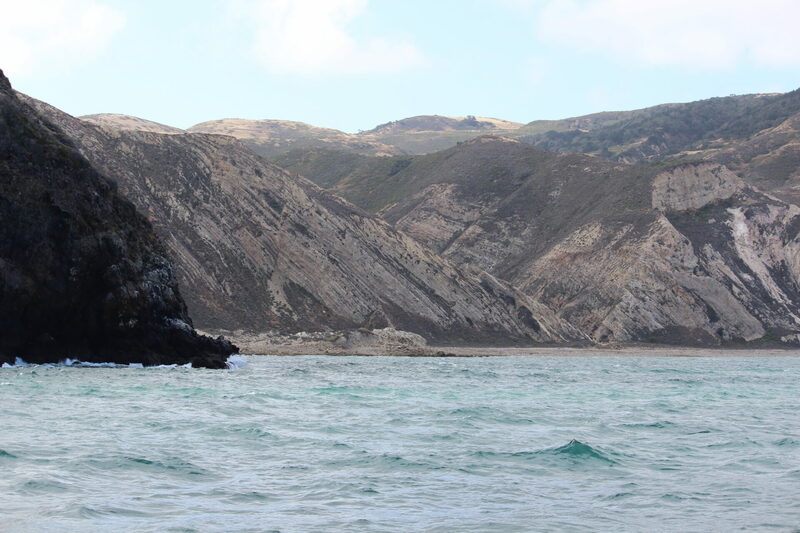 Do check out Chan McKearn’s blog – Escape Expeditions – here for more on his epic adventures, including other Channel Island boating adventures and escapades.